The mobile phone already does so much more than enable person-to-person communication. It's being used to browse across the world wide web, capture digital photos, access social network apps, play games and get travel directions. A new study from Juniper Research concluded that increased use of Digital Voice Assistants -- such as Google Now, Siri and Cortana -- on smart devices will provide new paid search advertising opportunities within the coming years. Juniper forecasts that over $12 billion of advertising spend per year will be made through this rapidly growing medium by 2021 -- that's an increase of over 3,000 percent on estimated spend for 2016. The new market study found that besides integration into devices like smartphones and PCs, digital assistant capabilities will be part of many home and automotive devices in future -- creating new spaces for human-computer interaction. Improvements in artificial intelligence have led to a proliferation of new voice controlled programs. The list of consumer electronics vendors offering these Assistant services keeps growing -- such as Amazon, Nuance, SoundHound and Vi -- as alternative solutions to those from Google, Apple and Microsoft. 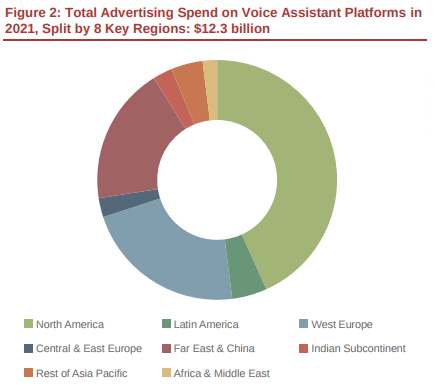 As much of the technology grew out of voice search, Juniper expects Digital Assistants to follow a similar monetization strategy, with companies paying to provide specific targeted marketing results. However, they often rely on data gathered about users, such as search and location history, shopping habits and demographic information. The consumer data liability issue will be concerning for some vendors and marketers, who could avoid the technology for privacy and security reasons. "Voice Assistants are a great opportunity to create more convenient ways to interact with devices," said James Moar, senior analyst at Juniper Research. However, they must balance the need for accurate data with consumer privacy requirements, and this will drive changes in how digital assistants are programmed in future, in order to make the data secure and totally under user control.